Article originally appeared in the Oakland Press on March 31, 2019 It began with just a single location in Pontiac in 2012. Seven years later, Honor Community Health has expanded to 11 different medical centers throughout Oakland County. The organization was established to provide medical care and assistance to those that have struggled to secure proper coverage and treatment. Prior to joining Honor in May of 2018, Claiborue was the medical director of a PACE program in Jackson, and also spent 12 years working at Henry Ford. The wide-ranging capabilities of Honor Community Health made an early impact on Claiborue. 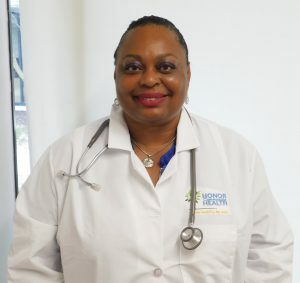 Now a West Bloomfield resident, Claiborue was raised in Detroit and earned her medical degree from Wayne State University. As a family medicine physician, she treats newborns, elderly patients, and everything in between. While Dr. Claiborue acknowledges the sometimes demanding nature of her work, she wouldn’t trade it for anything in the world.